Vampire Beauties: Vampiress Review: "Blood Kisses"
The Gist: A teacher starts acting weird and eventually starts sucking blood. Clarification: This film lost me I won't lie. Basically it's a rework of the movie Vampire's Kiss but way less understandable and not as fun. Guy who had a traumatic experience grows up seemingly normal but then starts having weird dreams of an encounter with a mysterious female that might not be dreams but mostly involve vampire like things which eventually just leads to him becoming a serial killer. The thing that makes the film hard to follow isn't by design as stuff just kind of happens throughout to the point that I'm not entirely positive they aren't just editing mistakes. 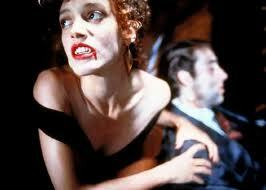 Female Vampire Factor: Her name is Abigail Quintard played by Nancy Malleo. Problem is unlike Jennifer Beals' Rachel in Vampires Kiss you rarely see her and isn't really seen as tormenting him as much as she's just a way to throw off the viewer as to whats going on. I give the movie a Vampire Beauty Rating of 2 out of 5. Just watch Vampires Kiss. You'll get more out of it.